Following the close of nominations for town and parish council on Thursday last week, the full list of candidates for all elections has now been published on Cotswold District Council’s website: http://www.cotswold.gov.uk/about-the-council/elections/current-future-elections/ (see ‘Notice of Uncontested Elections’). 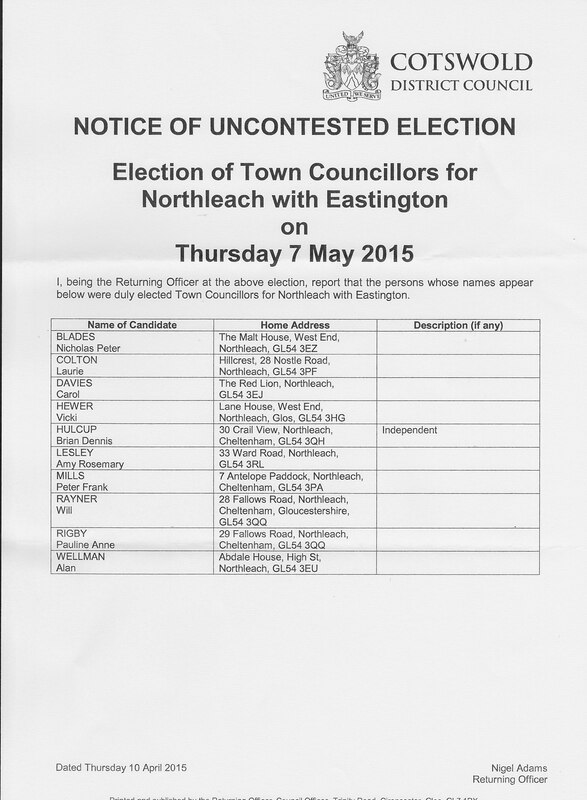 Northleach Town Council needed 11 councillors, 10 residents have put themselves forward and so the all these people have been elected uncontested. Current councillors will remain in position until four days after 7th May. At the May meeting the new council will look to co-opt another interested person to fill the remaining position. The new council will consist of the following current councillors: Nick Blades, Laurie Colton, Carol Davies, Vicki Hewer, Brian Hulcup, Pauline Rigby, Peter Mills and Alan Wellman. In addition Will Rayner and Amy Lesley will join the Town Council and we wish them a very warm welcome. At this point we would like to say a really big thank you to the councillors who are stepping down. Stephen Chilton, Nick Fisher and Graham Stock have all made a huge impact to the Town Council over the years. They have been key in committee and project roles and all of them are people who “get things done”. They will be greatly missed. ← Please Help Keep the Cotswolds Free from Litter!